On October 1, 1883, Brockton became the first place in the world to have a three-wire underground electrical system when Thomas Edison threw a switch to activate it. The City Theater opened on October 24, 1894, the first theater in the world to be tied into the three-wire electrical system. On December 30, 1884, the first electrically operated fire station in the United States opened in Brockton. The department store Santa Claus appeared in Brockton in December 1890, when James Edgar, of Edgar's Department Store, suited up for the first time. 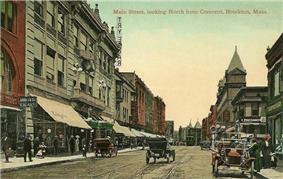 Brockton became the first city in the country to abolish grade crossings in 1896. On November 23, 2010, Brockton set the world record for the most Santa Hat wearers in one place at one time with 872 people participating in the event. 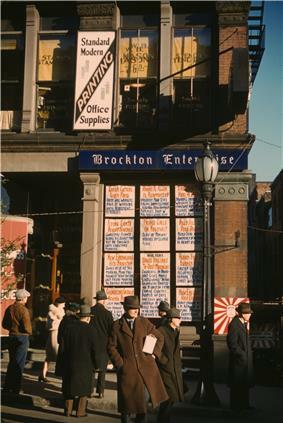 On November 20, 2011 Brockton doubled the city's Santa Claus hat-wearing record with 1792 people in downtown Brockton wearing hats. According to the United States Census Bureau, the city has a total area of 21.6 square miles (56 km2), of which 21.5 square miles (56 km2) is land and 0.1 square miles (0.26 km2) (0.56%) is water. Brockton is the 162nd largest city by land area in the Commonwealth, and the twelfth largest of the twenty-seven towns in Plymouth County. Brockton is bordered by Stoughton to the northwest, Avon to the north, Holbrook to the northeast, Abington to the northeast, Whitman and East Bridgewater to the southeast, West Bridgewater to the south, and Easton to the west. 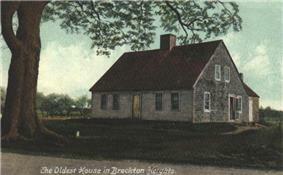 Brockton is approximately 25 miles south of Boston, and 30 miles northeast of Providence, Rhode Island. Brockton is mostly an urban setting, lying along the Salisbury Plain River, which once powered the many shoe factories of the city. To the northeast lies the Beaver Brook Conservation Land, attached to the southern end of the Ames Nowell State Park in Abington. There are several parks throughout the city, but the largest is D.W. Field Park, an Olmsted-inspired park which includes ponds, Waldo Lake and Brockton Reservoir in Avon, as well as a golf course. As of the census of 2010, there were 93,810 people, 35,552 households, and 22,764 families residing in the city. The population density was 4,398.4 people per square mile (1,695.9/km2). There were 34,837 housing units at an average density of 1,622.8 per square mile (626.5/km2). The racial makeup of the city was 46.7% White (42.9% non-Hispanic white), 31.2% African American, 0.36% Native American, 2.3% Asian, 0.04% Pacific Islander, 10.32% from other races, and 7.78% from two or more races. Hispanic or Latino of any race were 10.0% of the population. 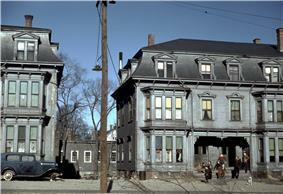 The African-American population in Brockton has grown significantly in the early 2000s. 2013 estimates state Brockton's demographics as: 42.8% White, 43.1% African American, 0.4% Native American, 2.0% Asian, 0% Pacific Islander, 10.3% from other races, 3.9% from two or more races. Hispanic or Latino of any race were 7.8% of the population. Brockton has the largest population of Cape Verdean ancestry in the United States, with 9.0% of its population reporting this ancestry. Brockton also reportedly has one of the largest communities of Angolans in the United States. As of 2000, there were 33,675 households out of which 35.0% had children under the age of 18 living with them, 42.0% were married couples living together, 19.9% had a female householder with no husband present, and 32.4% were non-families. 26.6% of all households were made up of individuals and 9.5% had someone living alone who was 65 years of age or older. The average household size was 2.74 and the average family size was 3.35. In the city the population was spread out with 27.8% under the age of 18, 9.1% from 18 to 24, 30.5% from 25 to 44, 20.8% from 45 to 64, and 11.7% who were 65 years of age or older. The median age was 34 years. For every 100 females there were 92.1 males. For every 100 females age 18 and over, there were 87.4 males. The median income for a household in the city was $39,507, and the median income for a family was $46,235. Males had a median income of $34,255 versus $26,886 for females. The per capita income for the city was $17,163. About 12.1% of families and 14.5% of the population were below the poverty line, including 19.4% of those under age 18 and 12.6% of those age 65 or over. Statistically, Brockton is the most populous and most densely populated community in Plymouth County. It is the sixth largest community in the commonwealth, the largest of the sub-100,000 person cities. However, it is only the twenty-seventh most densely populated community in the Commonwealth. Data is from the 2009-2013 American Community Survey 5-Year Estimates. On the national level, Brockton is a part of Massachusetts's 8th congressional district, and has been represented since 2001 by Stephen Lynch. On the state level, Brockton is represented in three districts in the Massachusetts House of Representatives: the Ninth Plymouth, Tenth Plymouth (which includes West Bridgewater and a small portion of Easton), and the Eleventh Plymouth (which includes most of Easton). 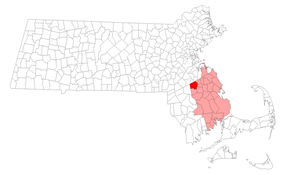 The city is represented in the Massachusetts Senate as a part of the Second Plymouth and Bristol district, which includes Halifax, Hanover, Hanson, Whitman and portions of East Bridgewater and Easton In addition to the Brockton Police department the city is patrolled by the Fourth (Middleborough) Barracks of Troop D of the Massachusetts State Police. ^ Edison's Fabulous Breakthrough in Brockton, Massachusetts, thomasedison.com; accessed April 16, 2014. ^ World Records Academy; accessed April 16, 2014. ^ "1950 Census of Population" (PDF). 1: Number of Inhabitants. Bureau of the Census. 1952. Section 6, pp. 21-7 through 21-09, Massachusetts Table 4. Population of Urban Places of 10,000 or more from Earliest Census to 1920. Retrieved July 12, 2011. ^ Cape Verdean ancestry by city, epodunk.com; accessed April 16, 2014. ^ "SELECTED ECONOMIC CHARACTERISTICS 2009-2013 American Community Survey 5-Year Estimates". U.S. Census Bureau. Retrieved 2015-01-12. ^ "ACS DEMOGRAPHIC AND HOUSING ESTIMATES 2009-2013 American Community Survey 5-Year Estimates". U.S. Census Bureau. Retrieved 2015-01-12. ^ "HOUSEHOLDS AND FAMILIES 2009-2013 American Community Survey 5-Year Estimates". U.S. Census Bureau. Retrieved 2015-01-12. ^ Index of Legislative Representation by City and Town, mass.gov; accessed April 16, 2014. ^ "Registration and Party Enrollment Statistics as of October 15, 2008" (PDF). Massachusetts Elections Division. Retrieved 2010-05-08. ^ Brockton Neighborhood Health Center website; accessed April 16, 2014. ^ American Medical Response website, amr.net; accessed April 16, 2014. ^ Canavan, Derek A. "Remembering Brockton's Greatest Tragedy". The men of the Campello firehouse were heroes that day. As hundreds of workers and residents of the Campello neighborhood ran from the fire, the Campello firefighters charged into the inferno looking for workers whose cries for help were barely audible over the roar of the flames. ^ Valencia, Milton J. (May 4, 2008). "A memory painful and indelible". The Boston Globe. Outside, the flames roaring through the walls and ceiling were clearly visible. But to the firefighters inside, on the balcony, the flames were hidden. 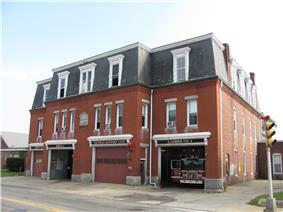 ^ Brockton fire department infosite, brockton.ma.us; accessed April 16, 2014. ^ Brockton Police Department website; accessed April 16, 2014. ^ "ENC's Adult and Graduate Studies Program expands into satellite locations around the state". Nazarene Communications Network. December 18, 2008. ^ America's Promise Alliance 100 Best Communities for Young People (2010); accessed April 16, 2014. ^ Mccready, Daniel (February 25, 2012). "Orchestra to bring 'Life' to Brockton". The Enterprise; retrieved December 3, 2012. ^ Staff (February 29, 2012). "Brockton Rox Join FCBL". pointstreaksites.com. Retrieved August 4, 2013. There is a central police station on Commercial Street, six fire stations, and three post offices (the main building, plus branches in Montello and Campello). The city supports three buildings within the Brockton Public Library system. The main library is a Carnegie building and is located at 304 Main Street, and there are two branch libraries. Based at Campanelli Stadium the Brockton Rox play in the Futures Collegiate Baseball League (FCBL). From 2003 through 2011 the team was a member of the independent professional Can-Am League but in 2012 decided to join the amateur FCBL. Collegiate players on FCBL teams, who are looking for more experience and scouting exposure, are offered non-paid playing opportunities. Brockton is home to the Brockton Symphony Orchestra, a community orchestra founded in 1948. The orchestra performs five or six concerts per season at local venues such as Brockton's West Middle School Auditorium and the Oliver Ames Auditorium in the neighboring town of Easton. The orchestra comprises 65 musicians from the greater Brockton area and its musical director since 2007 is James Orent, a guest conductor of the Boston Symphony Orchestra and Boston Pops. 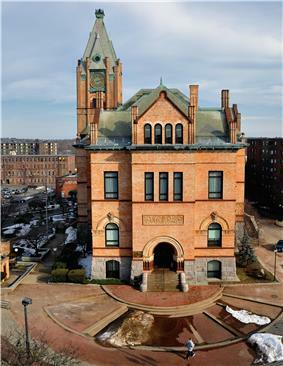 Brockton was named one of the 100 Best Communities for Young People in the United States in 2005, 2008, 2010, and 2011. This prestigious award is given out by America's Promise Alliance in recognition of those communities that are taking action to reduce dropout rates and provide supportive services to youth. Despite the challenges it has had over the years, Brockton has made the success of its youth a high priority and was honored for its continued commitment to education, mentoring and volunteerism. Through the collaborative efforts of the Plymouth County District Attorney's Office, the Mayor's Office, the Superintendent and Police Department, along with area nonprofits and parents, the community has flourished with a host of resources for its young people. The Middleborough/Lakeville Line of the MBTA's commuter line passes through the city on the eastern side, with stops in the Montello and Campello neighborhoods, as well as in the city center, providing service to points south and South Station in Boston north of the city. Brockton has its own bus services, operated by the Brockton Area Transit Authority (BAT). Each bus has a designated route running through a section of Brockton, i.e. Montello, Campello, Cary Hill, etc. There are also buses that have routes outside the city. i.e. Bridgewater Industrial Park, Ashmont Station (MBTA subway end-of-line), Stoughton and a connecting bus stop in Montello to the Braintree Station (MBTA subway end-of-line). Massachusetts Route 24, a six-lane divided motorway, passes through the west side of the city, with exits at Route 27 to the north and Route 123 to the south. The two routes pass through the center of the city, crossing at that point. Massachusetts Route 28 passes from north to south through the center of the city, The western end of Route 14 (at its intersection with Route 27) and the southern end of Route 37 (at its intersection with Route 28) both are in the city. 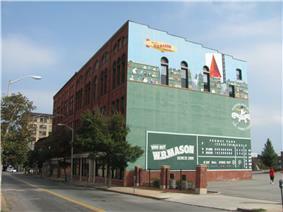 Brockton is the site of Massasoit Community College and Sullivan and Cogliano Training Centers. The Eastern Nazarene College offers Adult Studies/LEAD classes in Brockton. Brockton was home to three parochial schools (Sacred Heart, Saint Casimir and Saint Edward) which merged in 2007 to form two schools. Trinity Lower Campus at the former Saint Edwards school site, and Trinity Upper Campus located on the former site of the Saint Colemans school, one Christian school (South Shore Christian and the Brockton Christian School closed in 2010), and Cardinal Spellman High School, a Catholic high school named for Francis Cardinal Spellman, Brockton area native and former Archbishop of New York. There is a charter high school, Champion Charter School. Students may also choose to attend tuition-free Southeastern Regional Vocational Technical High School (in South Easton). Brockton operates its own school system for the city's approximately 15,600 students. There are two early education schools (Gilmore and Barrett Russell), ten elementary schools (Angelo, Arnone, Baker, Brookfield, Downey, George, Hancock, Huntington, John F. Kennedy and Raymond), the Davis K-8 school, six middle/junior high schools (North, East, West, South, Ashfield and the Plouffe Academy), Brockton High School and four alternative schools (Goddard, Edison, Champion and B.B. Russell). Brockton High's athletics teams are called the Boxers (after the city's undefeated heavyweight boxing champion, Rocky Marciano). The City of Brockton Police Department has roughly 181 sworn members and 31 non-sworn employees. The officers are assigned to the Patrol Division, and Operations Division which includes; Detectives, Narcotics, Gang Unit, Special Weapons And Tactics, K-9, Quality of Life, GREAT Program, Elderly Affairs, and Community Education Units. In addition the city has a volunteer chapter of the Guardian Angels who patrol the city several nights per week. Squad A Ladder 1 Tac. Support Unit(T.S.U.) 1, Special Operations Unit Car 55(Chief), Car 56(Deputy Chief), Training Officer 1 42 Pleasant St.
Engine 2 Ladder 2 945 Main St.
Engine 3 916 N. Main St.
Engine 4 Tower 1 305 Crescent St.
Engine 5 540 West St.
Engine 7 605 N. Cary St.
Below is a complete listing of all fire station and apparatus locations in the city of Brockton. In 1905, local newspapers recounted many heroic acts by Brockton firefighters during the Grover Shoe Factory disaster. On March 10, 1941, thirteen Brockton firefighters died when the roof collapsed as they were fighting a fire at the Strand Theatre. That fire resulted in one of the worst firefighting tragedies in American history. The city of Brockton is protected around the clock by 174 paid, professional firefighters of the city of Brockton Fire Department. TheBrockton Fire Department currently operates out of six fire stations, located throughout the city, and maintains a fire apparatus fleet of five engines, three ladders, one squad, one tactical rescue unit and several other special, support, and reserve units. The fire department does not provide EMS services; ambulance coverage is handled by American Medical Response. As of July 1, 2015 Brewster Ambulance of Hyde Park, Massachusetts will take over as the city's EMS provider. Brockton has a community health center that serves individuals with low income and poor access to health care at Brockton Neighborhood Health Center. Brockton has three hospitals, Signature Healthcare Brockton Hospital on the east side, Good Samaritan Medical Center - a Steward Family Hospital (formerly Caritas Good Samaritan, and before that Cardinal Cushing) Hospital to the northwest, and the Brockton Veterans Administration Hospital to the southwest. The VA Hospital is the sponsoring institution for the Harvard South Shore Psychiatry program. It serves as a teaching facility for residents of various medical specialties from Boston University, physician assistant students from Northeastern University, nursing students from the University of Massachusetts Boston and pharmacy students from the Massachusetts College of Pharmacy and Health Sciences.